Negril, Jamaica has a lot going for it including a 7-mile beach, family-friendly properties, great restaurants, and an eclectic mix of shops, lodgings, and eateries. There are lots of watersports available, plus trips to the coral reef. Keep in mind, though, even at laid-back Negril, you need to use common-sense about safety. Also, families who feel most comfortable in all-inclusive enclaves may want to stick to the Beaches resorts at the north end of Negril Beach. Bottom Line: Beautiful Negril Jamaica offers the chance to experience more of Jamaica, outside of the all-inclusive resorts. 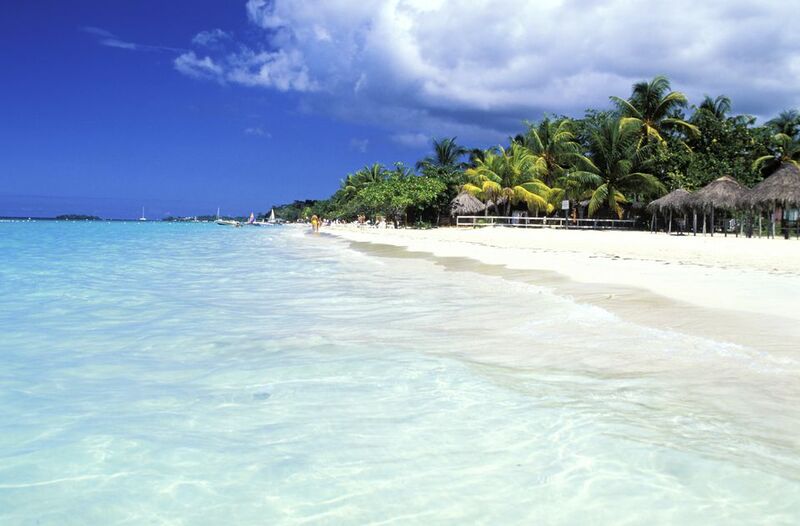 Negril is famous for its seven-mile beach, and for sunsets viewed from the beach or the cliff area to the south. Two all-inclusive family resorts (Beaches) are at the north end. Also, family-run small properties welcome families. Boat tours take visitors to the coral reef. You can also snorkel right off the cliffs (older kids only). Popular outings include YS Falls, Black River Safari, and the beautiful and quiet Mayfield Falls. In Jamaica, you don't just look at waterfalls, you walk in them. Negril has matured since its years as a legendary hippie hangout. True, adults may still be offered ganja, and there are boozy tourists around; but in general, the atmosphere is relaxed. The high season draws many families. Some visitors feel hassled by vendors so it's important to send a clear, polite signal that you're not interested. The best beach-walking is south of the Beaches Negril resort; farther north, you'll reach the Hedonism resort. As for walking the beach after dark: it's best to err on the side of caution. Negril Tree House: Enjoy the hammocks and wide verandahs at this friendly family-run place; breakfasts are terrific. A few suites have kitchens and unique layouts. Charela Inn: Charela's owners are French and Jamaican; the inn is known for fine cuisine. Charela has special family units. Crystal Waters: Guests rent a cottage that comes with a cook. Kuyaba: The beachside restaurant gets top marks for local-color decor. Merrils II: Beachside restaurant; attractive units; small pretty pool. You'll find other restaurants right on the beach, as well; eclectic and funky styles still make appearances. A stay at Negril's smaller properties is an old-fashioned beach holiday: probably no programmed activities or video game centers. The beach is perfect for small kids, gentle and with good sand for sand-castles. Some properties offer watersports such as kayaking, sunfish-sailing, and sunset cruises. Also, various small outfits along the beach offer glass-bottom boat rides or snorkel trips to the nearby coral reef. Negril typically has calm seas even when the north coast is rough. Simply walking along the beach is fun. Stop and sample different restaurants for snacks or drinks. You'll find small shops along the way, or head to the Times Square mall where you can barter even inside a proper store. At the south end of the beach are the low Negril cliffs, actually made of old coral. Though not suitable for families with little ones, the cliffs are a great place to snorkel. The most famous spot on the cliffs is Rick's Cafe which for some reason is the place to watch the sunset. Kids will enjoy watching tourists jump off 40-foot cliffs into the sea.